Rather than two small stereo speakers in your OEM dash speaker position, how about one large, stereo converted speaker with dual tweeters? This unique speaker design sounds better than anything on the market that will fit the vehicle's single dash speaker location. Both stereo channels are connected to this one speaker, which routes the low and mid frequencies to the large bass cone; while separating mid to high frequencies and sending them to the dual voice coils in the center of the speaker. Features 70% more cone area than dual dash top speakers. The extra large magnet, 140 watt capability and high tech construction make this our favorite choice for dash speakers in classic Mustangs! 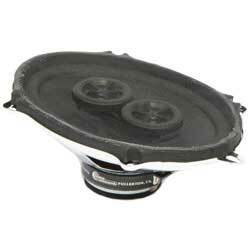 This speaker fits 1967-68 Mustang models with AC and 1969-73 Mustang models in the dash speaker location. Also fits a variety of other classic American car models, and it can be used in the rear on certain models as listed below. Sold Individually.